UPDATED: Mon., May 28, 2018, 6:01 p.m.
PARIS – Like Novak Djokovic, Stan Wawrinka is a past French Open champion still working his way back into form after surgery. 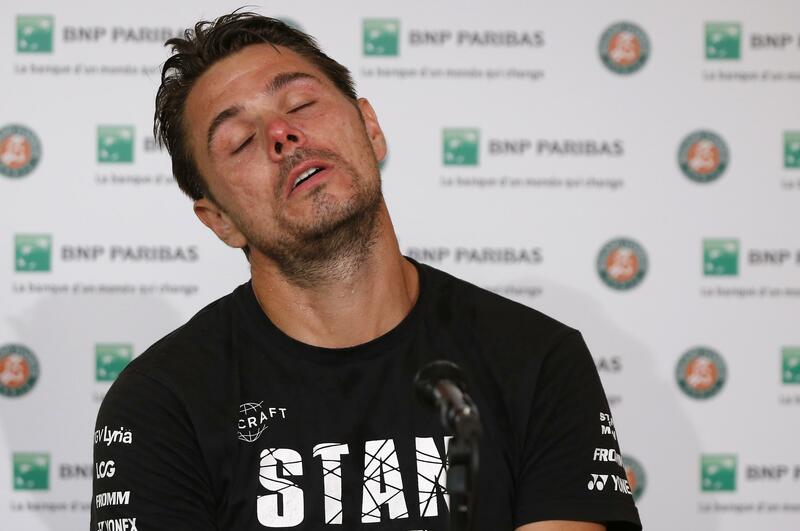 Both men were in first-round action at Roland Garros on Monday, but unlike Djokovic, who won in straight sets, Wawrinka could not summon and sustain the sort of high-level play that has carried him to major titles in Paris and elsewhere. Returning to a place where he won the title in 2015 and made it back to the final a year ago, Wawrinka bowed out with a 6-2, 3-6, 4-6, 7-6 (5), 6-3 loss to 67th-ranked Guillermo Garcia-Lopez of Spain. The owner of one of the prettiest one-handed backhands in the sport, Wawrinka – who is again working with coach Magnus Norman – managed only 12 winners, compared with 35 unforced errors, with that shot. He finished with 72 unforced errors in all, 32 more than Garcia-Lopez, who never has been past the fourth round at a major tournament. Djokovic – a former No. 1 now ranked 22nd, his worst spot since 2006 – beat 134th-ranked qualifier Rogerio Dutra Silva of Brazil 6-3, 6-4, 6-4, quickly recovering after dropping the opening two games. Since winning the 2016 French Open to complete a career Grand Slam and become the first man in nearly a half-century to collect four consecutive major trophies, Djokovic has taken a step back. He has not added another major championship since, and after dealing with right elbow trouble for more than a year, he finally opted for surgery in February. Beginning his bid for a record-extending 11th French Open title, he never quite seemed to be at his absolute best against 129th-ranked Simone Bolelli of Italy, and while Nadal grabbed the first two sets 6-4, 6-3, he was trailing 3-0 in the third when action was halted. Published: May 28, 2018, 5:59 p.m. Updated: May 28, 2018, 6:01 p.m.